Oh that is just the sweetest picture! Love! Oh my goodness, how sweet!! They look so happy to be with each other :-) What precious babies...have a sweet dreams. Awww... they look like sugar and spice and everything nice! Thank you for sharing such a sweet picture and it was wonderful meeting you at BlogPaws! That beautiful picture made me happy too! They really do look like good friends. How sweet! Oh, they are just precious! We see they're foster kitties and send purrs that they find wonderful forever homes! Aww !!! Soooooooooo Cute !!!! 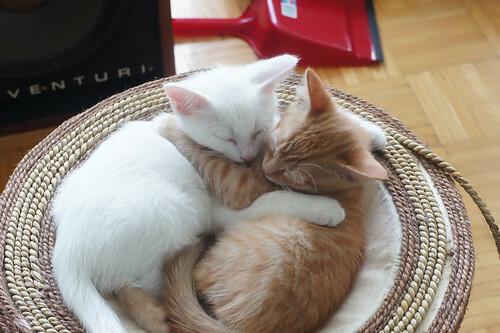 Awwwwwww!!! Happiness is not only "a friend," but "a friend to cuddle with!"